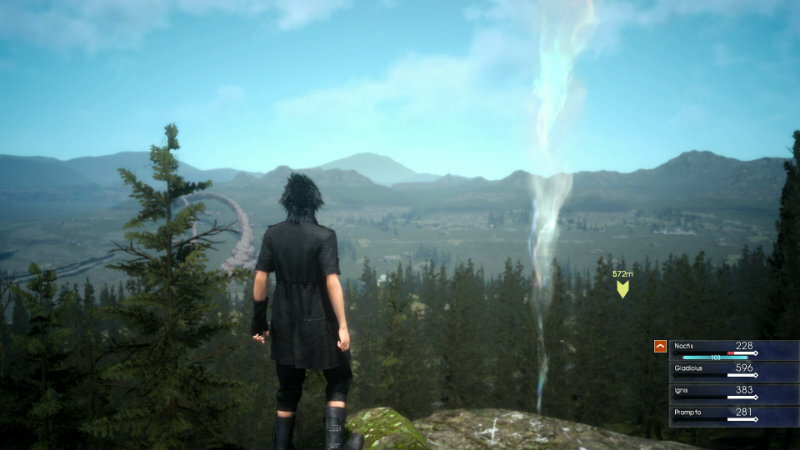 Final Fantasy XV preview: Deus que? 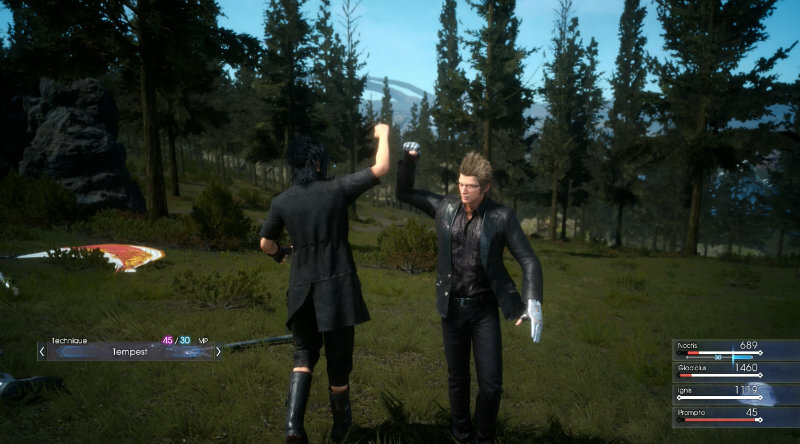 Final Fantasy XV has been a long time coming. As a gift to fans who have been waiting patiently, Square Enix has released a rather meaty demo to show what the final game will be like. Certain elements will change in the final game, but it certainly does give a taste of what’s to come. Warning: I will avoid giving major spoilers, but if you want to go in totally pure, don’t read beyond this point. 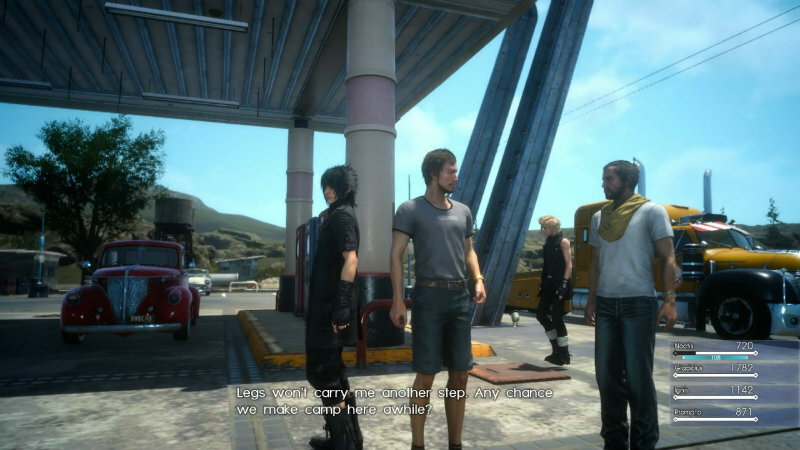 Episode Duscae takes place at an unknown point part of the way into the game where Noctis and his crew have some car trouble. Forced to run around on foot, they must raise enough money to pay for their car’s repairs. Of course, they also go exploring, learn how to fight and make camp along the way. There is a main mission for players to progress through that involves hunting and fighting a Behemoth, as well as gaining a summon. However, the demo reveals much more than just a story. The first thing that is immediately striking is just how gorgeous the environment is. From hills and grass to forests and rocky ledges. Each aspect is beautifully textured – gone are the days of awful foliage as every fern, blade of grass and tree branch looks and feels like the real deal. Even clipping issues are way better as you can run through the forest and the environment remains intact and immersive. The combat system is all new, as it should be with a new Final Fantasy game. Instead of waiting for a timing bar to load in order to take actions, you can use a real time fighting system complete with dodging incoming attacks and combining special moves with normal attacks. Special moves work off of MP points which you will need to be careful to balance – if you use them all up you end up in stasis and are unable to do anything until your points regenerate. It ends up feeling incredibly quick and fluid. Plus, when taking on agile enemies, it finally makes sense why your character would miss in previous games – some of them are incredibly hard to hit without using a special ability. It’s nice to experience that variety of movement in the enemies. Interestingly, you play solely as Noctis in the demo. During combat, your comrades will help out with fighting, although one of them is particularly weak and I found myself rushing to revive him far more often than I would have liked. If the player’s HP hits zero, you can use a potion to heal or wait for one of the others to pat you on the back and comfort you to full health again. Frequent bouts of incapacitation will result in a lower maximum health bar, though, so you do still need to be careful. I was intrigued by the idea of camping in the game, but it really works well and fits in nicely with the day/night cycle. As you progress through the day, you’ll start seeing the colors turn towards dusk and the shadows begin to elongate. The characters will mention needing to make camp and your buff from camping the night before will wear off. Thus, it makes sense to make for the nearest camp site and have a rest. In the demo, the best possible food that you can make is shown – you don’t have an option to choose what’s on the menu. I’m not sure if this will be changed in the full game or if consumption will always be optimized. The food gives specific buffs for the coming day, such as negating status ailments or boosting EXP gain. Once you accept the food, your experience is applied to the party, leveling up. I found the leveling in the demo to be incredibly rapid. It’s unclear at this point if this is just the nature of this point in the game, or if this is how it will be in the finished product. However, at every camp site I ended up leaving up by at least two levels, but usually closer to four. Side missions also give experience and I found setting markers on the maps to be initially confusing but eventually quite helpful. You could either set your markers on main or side quest objectives, or are specific camp grounds or outposts. 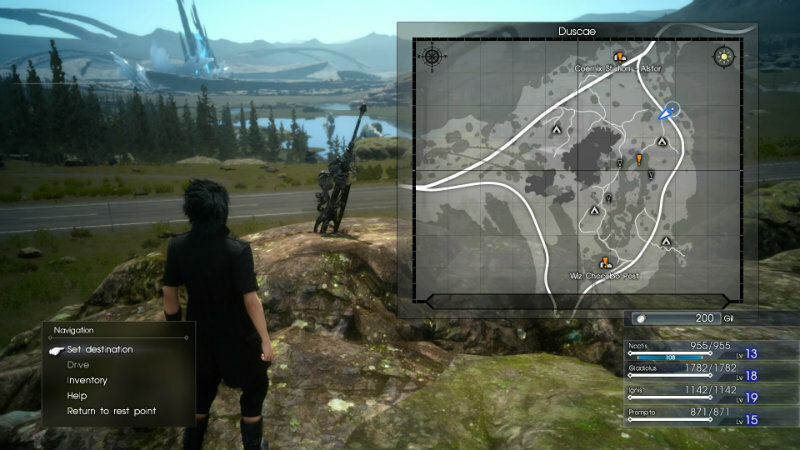 There’s no scrolling around the map to decide where to set a marker, but it works out well enough to set the markers on the exact location where you want to go. Despite a lot of focus on the demo, it is still a rather glitchy experience. Noctis has the ability to warp in combat. This is used to warp to high ground to boost regeneration as well as find the enemy and execute a warp attack. However, I somehow managed to warp into a mountain wall during one battle, only escaping when the next bunch of enemies happened upon me, allowing me to do a warp attack back out. While much of the demo looks great, I found that on the Xbox One the frame rates dropped quite dramatically, especially while under attack. This led to some rather frustrating moments when I couldn’t even move or escape from a deadly situation. I was also rather underwhelmed by the character development thus far. It is still incredibly early on, and the demo is just a small slice of what the game will hold, but I found the four guys to be incredibly bland and undifferentiated. Sure, one was the tough guy and another one was the wimp who I had to keep reviving, but at this point they don’t really feel like unique and enjoyable or relatable characters. Finally, there is a definite modern feel to the game. Not futuristic like some of the tech creations have been in previous Final Fantasy games. This feels rather current, with cars and mobile phones and the like. While the game still feels fantastical and there are plenty of audio and visual cues to remind me that this is a Final Fantasy game, I’m just not convinced about the technology yet. I’m assuming that it will all be explained better in the released game, but at the moment it’s feeling a bit out of place in that universe. The demo is incredibly meaty and offers a significant amount of gameplay for fans of the franchise. There are stunning visuals (I was really taken aback when I saw the summon) and enough familiar elements to make you really feel like you’re playing the next Final Fantasy game. 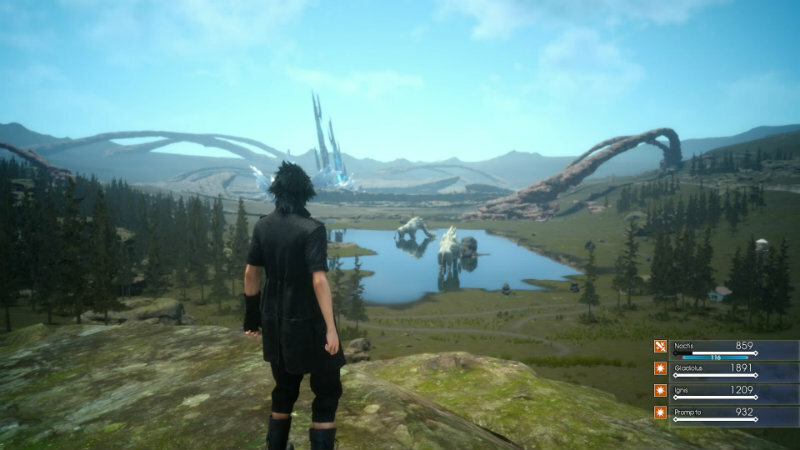 I enjoyed my time playing the game and I want to play the final product, although I felt like I was left with more questions than answers about Final Fantasy XV.